Click here to see the original page. Click here to see the original page. opium poppy which is a long-cultivated pharmacy and food plant. explain as a flowering Silene. Any other ideas, especially about the heads? Could they simply refer to the effect on the head of using the two plants?! The name of the plant is confirmed by the women head painted in the roots. I believe the plant you suggest, Caulophyllum thalictorides, is a North American plant also known as squaw root and papoose root and which was used by North American natives. I don’t believe it was known in Europe until the Sixteenth Century. Most, probably all, plants found only in North American weren’t, unless a few were brought back by the Greenlanders/Icelanders. Are you suggesting a Sixteenth Century date for the VMS? If you are suggesting an earlier date, are you suggesting a North American native origin of the VMS and of the vellum, glyphs and artistic style? If so for any the these, do you have any other evidence for, proof of, or references to, your ideas? I would very much like to read or view it or them. It would be chronologically possible for American plants to be included in the manuscript, if it wasn’t written until the pages were at least several decades old. I’ve heard that sometimes this kind of page (vellum) has been known to be stored for a while before use, or get used once and then cleaned and then used again, but I don’t know how common that was. But in addition to the chronological difficulty, there’s also a cultural one. Even after becoming aware that a “new” plant from North America existed, they wouldn’t have any particular traditions regarding it, so why would it get included in a manuscript of their own traditions of plants they were already familiar with? Hey look this new plant they brought back from America. It’s called potato. Only eat the tubers though. Remember, do not eat the berries, I have seen people die from it. I fully agree with your comment, the concentration of the plants are more in Europe, the Italian, German, Austrian Alpes. The German name of the plant “Frauenwurzel”, or “Frauenwurcz” in old German or also called today “Hahnenfuß” has an other Latin Name. The Caulophyllum thalictorides is the wrong name, can´t be correct, my error. I have to research for the correct latin name. Sorry, my JPEG converter does not recognize Voynich 1.01 font. 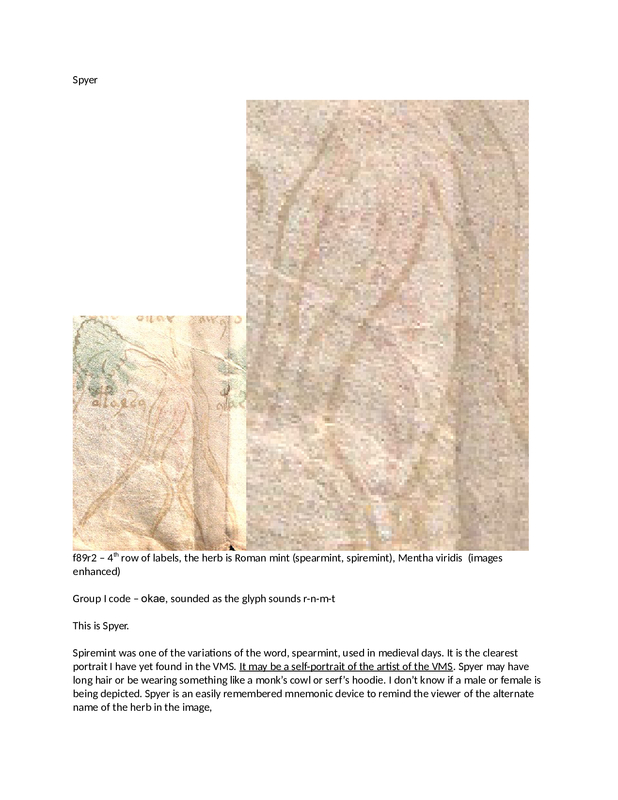 The photo caption’s Voynich glyphs are EVA = otal – (the first four glyphs in the label). I sent a post yesterday. It doesn’t seem to have made its way through the system for some reason. Will try again. I think the plant is sorrel, Rumex acetosa, also known as surel dé boys, sorel dé boys, surel de boise, and other spellings in medieval England. There are at least two other images with faces in the roots – on f89r1, third row of labels, 2nd label and plant is duck’s meat, Lemna minor, shown by faces ducking a meeting by hiding behind root strands – and on f89r2, fourth row of labels second label and plant is the face of Spyer peering out from the roots and representing Roman mint or spearmint/spiremint, Mentha viridis. It may also be the face of the artist. When I first saw the plant on 33r I initially thought of a variety of poppy plant. But its only a guess. Not even an educated one at that. VS word is something like Hashtas or if two words the first word is like Hash. Turkish for poppy is hashas. Some time ago, by an accident I discovered this website and work of profesor Bax and all the people that help. I am very impressed! Although my knowledge is a lot smaller, I am not any specialist of languages or anything like this, and my native language is not English, I would like to participate a litle bit in solving this mistery. I was doing some research on this plant (taking two possibilities under consideration, opium and mandragora). With the known letters I couldn’t find unfortunately any good matches in other languages. I realise that the recognision of this plant is not settled yet, but still, I looked for second and further words, since I couldn’t match anything with first one. What I saw then was that the first and second word are quite similar. If you don’t look at the first big letter (starting the first word) ou could say they look very alike. Now the words three and four. Starting from the “big” character again (in the middle of the word 3 and beginning of the word 4) they look the same for me. I have no idea if that i relevant at all, or what could it mean? Maybe just different versions of the name, or like it was with Chiron, name of some creature that the name come from. I know it doesn’t bring us closer to the translation, but maybe at least to some other conclusions. Lately I watched your videos. You really inspired me to pick up on the Voynich manuscript again, so many thanks! As to the plant on folio 33r: I would identify the plant in question as Convolvulus scammonia (Scammony). Wikipedia gives a basic description of the plant. Especially the leaves are a good match. On first sight the flowers correspond less to the picture in the manuscript. 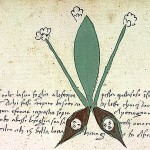 However, other plants in the manuscript have an exaggerated calyx also, so I would rather view this a a style of drawing. Examples are: f10r, f14r, f15r, f15v, and so on. The calyx in many Convolulaceae is prominent, though. It usually consists of a few small leaves, that are partly or completely fused together. <a href="http://www.turkiyebitkileri.com/fotogaleri/1102013112730399Convolvulus%20scammonia%20Ziyaret%20DSC_6182.jpg"This picture gives a good view an the calyx and flower. I think it’s rather like what the Voynich artist shows. I can see lines there and even dots (which refer to hairs in my opinion). 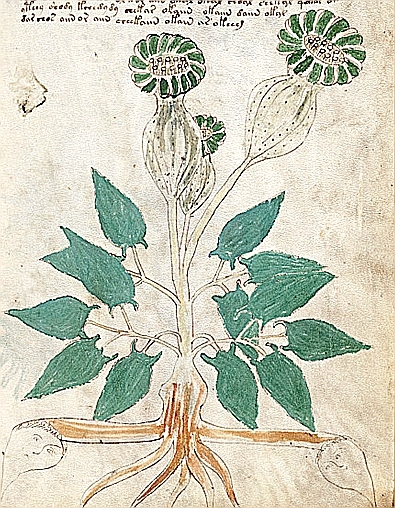 The picture also show the green stripes on the underside of the flower, which are also shown in the Voynich drawing. Next to the root: Convolvulus scammonia has a fleshy root that contains a white milky juice. The dried juice is also known as “scammony”. So far I found mulitple sources that commented on the way the juice was harvested. <a href="http://www.botanical.com/botanical/mgmh/b/binwsy42.html"Here is one. The faces that are drawn might be a reference to the milky juice that can be obtained by draining the root or the way it is collected. There might be a link with the moon there, because of the white juice. I plan to dig a lot deeper into this, because this seems to be a very interesting plant with a very interesting history! One line of inquiry will go into arabic herbal remedies. For instance, “The World of Pharmacy and Pharmacists in Mamluk Cairo” by Leigh Chipman lists recipes that contain Scammony. This line of inquiry is especially interesting because one of the “recipe-pages” in the manuscript (f89r1), shows a plant that also has faces drawn on its roots. It is by no means certain that the same plant is depicted there. It’s not the only plant in the “recipe-pages” with a face, f101v2 has another one. But that one doesn’t have a name tag next to it, and I find it harder to match the leaves of that picture to the plant of f33r. Anyway, lots of work to do for me to follow up on this! I think your case would be strong, but there is a separate page that – IMHO – is absolutely Mandrake. Quire 7 – page f51r has the classic ‘walking legs’ that mark the Mandrake plant in period (when not shown as a human body with leafy hair). No other plant is shown that way – and Mandrake is so indicated up to nearly modern times. I grant the leaves are off – although the flowers are not too dreadful – but… I can not imagine that then-univeral legs image would be used for any other plant. Your idea that the heads represent the effects of the plants makes sense to me. 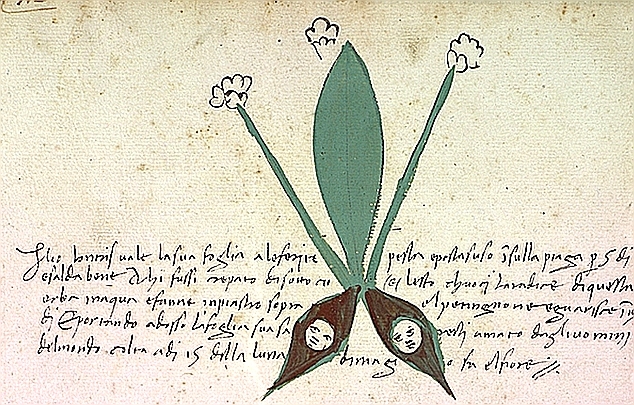 I think they also represent the general shape of the root: the differences between Allium, Torogas and the Voynich plant seem to me to suggest that the three had different kinds of “bulbous” roots. Ecco che tra le radici delle piante appaiono animali come serpenti, pesci, cani, ma anche volti e particolari anatomici umani. Anche perché si riteneva che una pianta potesse curare un organo per somiglianza, come una peonia con forma rotonda potesse curare la testa, i pinoli fossero un rimedio per denti, e così via. (Among the roots of the plants, animals such as serpents, fish, dogs, as well as human faces and anatomical details, appear. It was believed that a plant could cure an organ by similarity, peonies, having a rounded shape, could cure the head, pine nuts were a remedy for the teeth, and so on). Can any Italian speaker suggest why the faces?! With updated script name, more probable is garlic, la: Allium sativum, hy: սխտոր [[email protected]’or].